As is being reported just about everywhere else in Comicsland, Mart Nodell passed away this weekend. 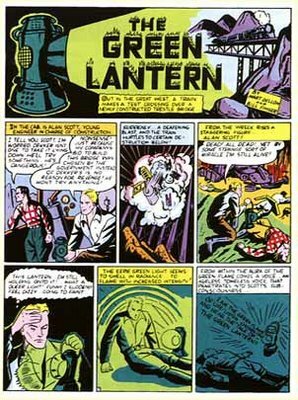 He's best known for creating the original Green Lantern, but also had a long career in the ad game and reportedly played a role in creating several well-known advertising icons, including the Pillsbury Doughboy. I met Mart and his wife Carrie at a comic con in Maine I worked at about 12 years or so ago, and was lucky enough to share dinner and an episode of Lois & Clark with them and some of the other con staff afterward. It was a great time, and Mart and Carrie (who passed away a few years ago) were absolutely wonderful, the sort of people you wished you could adopt as honorary grandparents. Though I only knew them for one day, I can honestly say that I'll miss them both.